Crackle provides you with a great number of TV shows and movies for free. You can watch many Crackle free movies including Hollywood movies as well as original action, crime, horror, comedy and sci-fi shows. Crackle enables you to enjoy any contents on line or on portable devices as long as the network connection is available. However, it might be a little disappointing when the Crackle movies or shows are interrupted by ad, or you have to wait for buffering if the Internet speed is not impressive. Why not just download Crackle movies and watch them offline on your Mac or portable devices anytime you want. Here you will get the easiest solution to do so. If you want to save a Crackle movie to your computer, iTube Studio Video Downloader could be your must-have Crackle movies downloader. It can help you to download videos from crackle.com in one click. Besides Crackle, you are also able to use it to capture videos from 10,000+ sites like YouTube, Vimeo, VEVO, Dailymotion, Facebook, etc. And you also can convert the downloaded videos to fit your portable devices. This Crackle download app has a built-in media player, so you can easily play the downloaded videos or your own desktop videos. •	Download videos from 10,000+ sites such as Crackle, Google Videos, YouTube, VEVO, and more. 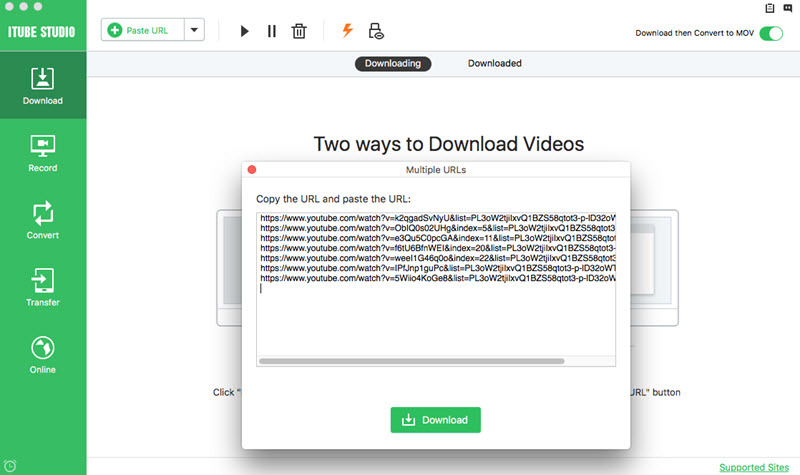 •	3 different methods to download the videos - with the Download button, by copying and pasting the URL, or simply by direct recording. •	Faster download based on the multithreading techniques that come inbuilt with the application, it allows you to make the full use of your internet bandwidth. •	No need to wait for the long list of videos to download, select any one from the 3 scheduler options as you like; Auto Shutdown, Enter - Sleep Mode or Exit Program. •	Lets you convert the downloaded videos to MP4, MPG, AVI, and more. •	Downloaded videos are automatically saved and you can even import your local MP4 & FLV videos to the inbuilt Library. •	Private Mode to download videos into a password-protected folder preventing being seen by others. 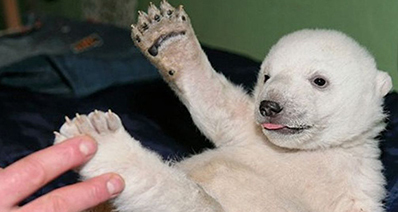 Click above Download button to get the Crackle video downloader. And then double click the downloaded program file to launch the installation wizard and follow up prompts to set up the program. Below is the step-by-step tutorial on downloading Crackle videos on Mac. Windows users can also take the same steps. Now run the program. And you can go to crackle.com to find your favorite movies. When you play the Crackle movie, you will see a Download button on the video window. You can directly click the button to add the video to the download queue immediately. You can also download the movie from Crackle with the video URL. To do so, you can drag and drop the direct video URL to the program. Then the program will detect the video and start downloading it. Or you can copy the video URL and click the Paste URL button on the main interface of the program to download it. After you have the Crackle movies, you can then convert them to any formats or for your portable devices if necessary. You can go to the Downloaded tab on the main interface of the program and click Convert to open the window for output format options. Then you can select specific video/audio format, or select a device model to set it as output target. After the conversion, you are able to put the movies on your device and play them on the go. Try it now. 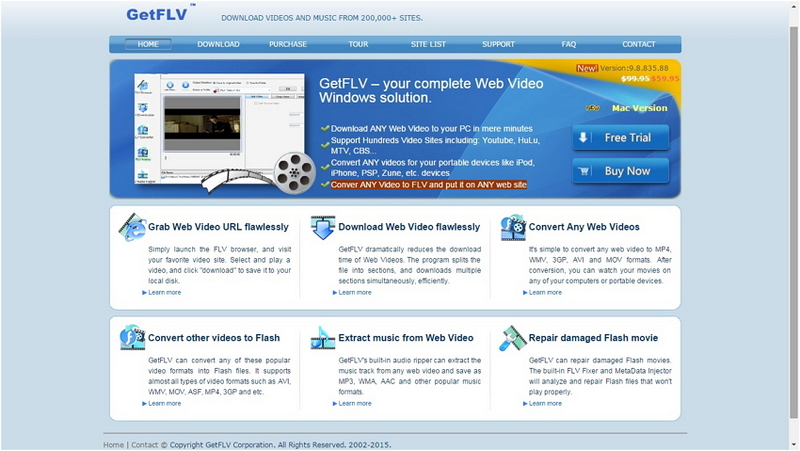 GetFLV is one of the many efficient programs available today that do the job of a downloader very well. However, what makes us list it on our article is the fact that it is much more than just a downloader, and it converts as well. Moreover, it is a very simple to use software and hence a great option. •	Simple layout ensures easy utilization of the program. •	It splits the file into sections and downloads them simultaneously resulting in faster downloads. •	Converts into many formats such as MP4, WMV, AVI, 3GP, and MOV. •	Can also convert Flash files. 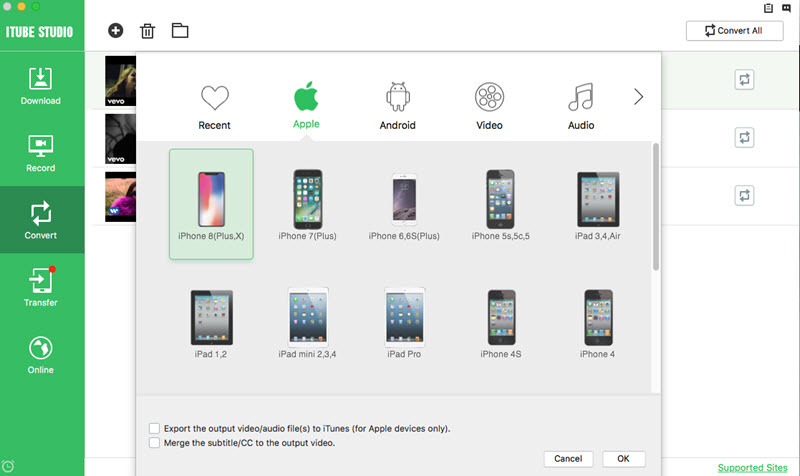 •	Supports formats such as WMV, ASF, MOV, 3GP, MP4, and more. •	Lets you extract the audio out of your downloaded videos and convert them to MP3, AAC, WMA, and other popular music formats. •	Though it comes with a simple layout, GetFLV has many functions. •	Definitely one of the faster downloader in the market today. •	Not all portable gadgets are supported. 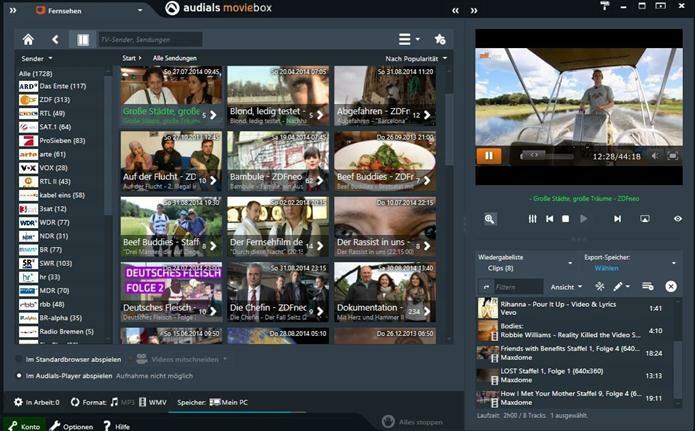 If you don’t have the time to download software and download a video or two, you can resort to utilizing an online downloading site such as Audials Moviebox. It records HD movies from video-on-demand services, video clips from websites and TV series from the media libraries of TV stations. It does so without loss of quality and automatically saves videos in any desired format for PC, smartphones, tablets and gaming consoles. •	Its sleek layout is easy on the eye and are easy to utilize. •	It supplies you with videos both in and out of public demand, as long as the sites are supported. •	While its features sure are handy, it complicates the design a little. 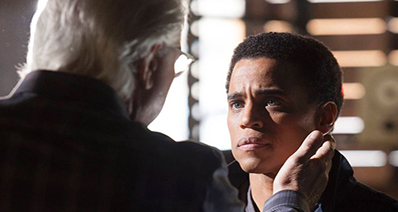 Crackle is a company offering free movies and TV shows across a variety of platforms. It was conceptualized on the year 2002 by its founder, Josh Felser, under the original name Grouper. Since then, it has gained a slow reputation on the world of online video streaming services. Only during the year 2006 when it was purchased by Sony Pictures Entertainment, that it established popularity and distinction amidst the presence of tight competitors such as Netflix, Hulu Plus and IMDb. 2011 and 2012 were seen as years of expansion as Crackle made itself available on platforms such as the PS3, Roku, Xbox 360 and other Sony-owned devices. The company later on created its own apps for both Android and Apple users. Crackle viewers can enjoy a complete, uncut footage of TV shows and movies on the ad-supported platform. Watching your favorite movies using this streaming service can better be enjoyed by downloading the Crackle app on any Android or Apple device. Creating an account on the service counts next to installing the app. This is to ensure that you get the benefits of the platform in order to create your own preferred watchlist. On the app are various categories you can select on depending on your viewing preference. More and more TV shows and movies are expected to be added to the Crackle library to cater to the growing entertainment needs of its users. Clicking on the “Watch Later” creates a watchlist of shows and movies you want to save for later viewing. These can also be removed by clicking on the “X” icon found on your watchlist. There are captions to aid you will watching. However, you can also turn this off by clicking on the gear icon setting found on every video playback. Using Crackle to view the latest videos and TV shows is a breeze since it offers an easy navigation for all its users. Various devices can also connect to Crackle, making it easy to use the service using different gadgets.